Time, especially the time we exerience conscously, is one of the last real luxury goods of the world. There is much more to it than the sequence of seconds, minutes and hours in defined rhythms of work and free time. We want to make a contribution to enjoying our time and experiencing the moments that make us stop and reflect. 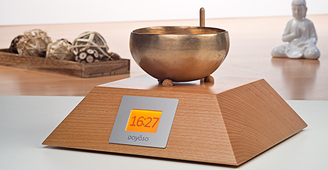 To create a sensual experience of time, we combine time and sound in our Dayasa singing bowl clocks. For this, we use the traditional singing bowls from Tibet, Nepal, India and Japan, whose sound has a noticable effect on body, mind and soul. The use of natural materials and a sustainable production is important to us. Domestic woods, honest craftmanship and the sound of far-eastern singing bowls give a Dayasa its inimitable character. In this sense, a Dayasa is not only an alarm clock – it is an attitude towards life and an expression of appreciation for our environment and for ourselves. Different shapes and colours in combination with numerous singing bowls and natural materials make every Dayasa special. The idea of the Dayasa clocks is to make time perceptible through the original sound of singing bowls. In addition to its pleasant alarm function, the Dayasa offers many possible applications. Learn more about the applications of singing bowl clocks. Real handmade singing bowls from Tibet, Nepal, India and Japan. The display is just touched by the fingertip and makes operation really easy. The housing is made of solid wood from domestic forests. No plastic, no imitation – just real wood. 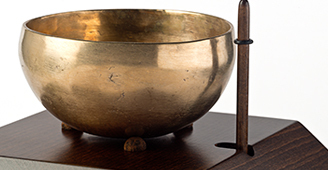 Different singing bowls – and that means different sounds can be selected. In addition to time and hourly gong, the Dayasa has several alarm options and a countdown timer. Wood as a renewable resource for the housing, short transport routes and the production in Germany protect our environment. The strength of the clapper can be adjusted in up to 10 levels. The Fibonacci sequence supports a gentle awakening with gong intervals that slowly get shorter and shorter. The operation with batteries avoids harmful influences of electromagnetic radiation. Great gadget: fits perfectly with my furnishing and wakes me up gently every morning. I would not want to do without it anymore – Thank you! A few weeks ago, I bought the clock mentioned above from you, and I would like to tell you today that I am absolutely thrilled by my singing bowl alarm clock. I had called beforehand to get some advice. The operation really is absolutely easy (in contrast to the last model). And the recommendation to choose a japanese bowl because it reverberates longer was also very good. I am happy every time I here the sound, really fascinating. So, all in all a fantastic development. Thank you! I enjoy the singing bowl clock very much. The fine packaging alone made me enjoy unpacking the clock like a jewel. I am still experimenting with the different functions. The shipment and payment were incredibly fast! This clock is a great idea and an enrichment! the Dayasa arrived today safe and sound, how beautiful it is and how great the japanese singing bowl (absolutely take the soft rubber) sounds! The operation is easy and fast and I hope it will reliably wake me up every morning. Again, thank you very much for this fine work. Today I got the alarm clock. It was pure joy to unpack it. And the alarm clock is so beautiful.